OTTAWA, CANADA - Eurocom Corporation has released the Python D470K notebook based on the AMD AthlonTM 64 processor. The AMD based notebook model is a perfect solution for highly demanding gaming and graphics applications. The EUROCOM Python D470K is a powerful, stylish and fully upgradeable 17-inch widescreen desktop replacement notebook based on AMD AthlonTM 64 processor. The model offers users 128MB DDR video memory with 8x AGP ATI Mobility Radeon 9700 graphics card and memory up to 2GB DDR400. The system is fully configurable with a choice of hard drive up to 60GB 7,200rpm or 80GB 5,400rpm, a choice of optical drive, such as: 24x COMBO or 2x Dual-DVD+-R/RW (DVD Burner) and a standard 3-in-1 card reader (MMC/MS/SD). The D470K model uses the redesigned D470 case with modular bay for internal TV Tuner. The Python D470K model is designed for users looking for a powerful mobile computing solution combining great gaming with business performance. Sporting a large and bright 17-inch display in a wide-screen format the notebook offers an outstanding movie presentation experience. A true desktop replacement, the D470K model configured with a DVD Burner, internal subwoofer and internal TV tuner may indeed replace both your television and your desktop PC. The new AMD AthlonTM 64 processor, designed specifically for desktop replacement notebooks provides exceptional performance for demanding software applications as well as built-in support for future 64-bit applications. 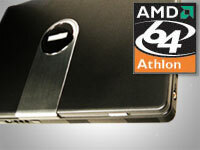 The AMD PowerNow!TM technology enables advanced power management and longer system battery life. Notebook computers with the AMD Athlon 64 processor are able to deliver desktop-class performance for the most demanding software applications. With the AMD Athlon 64 processor, mobile users can enjoy outstanding performance on PC software including productivity, entertainment, and gaming. As the first PC processor for notebook computing to run on the AMD64 platform, the AMD Athlon 64 processor can provide superior performance on today’s software with complete readiness for the coming wave of 64-bit computing. Loaded with features, the new EUROCOM Python D470K model, is a perfect solution for highly demanding gaming and graphics applications.